In time for two new LG smartwatches, the Watch Sport and Watch Style, Google on Wedndesday launched Android Wear 2.0, an updated OS meant to put Android watches on par —or at least closer to par —with the Apple Watch. 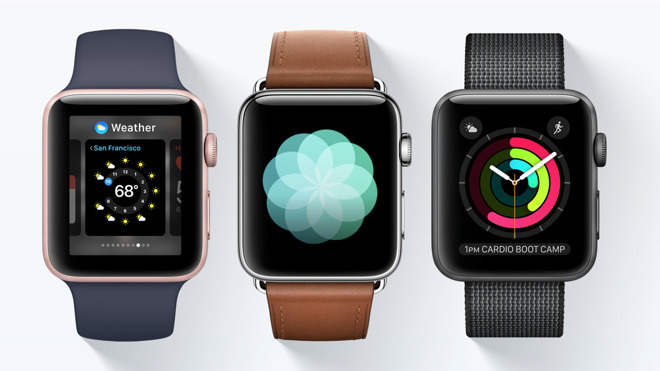 Here's how the new software compares with Apple's watchOS 3. Android Wear 2.0 now allows complications from any app for any watchface, so long as the face supports complications in the first place. In 1.x, only first-party complications were available. This matches watchOS 3's complications setup, and indeed Android users can now quickly swipe between watchfaces when customizing them, much like the watchOS 3 carousel. GPS-enabled Wear 2.0 devices have also gained the ability to track location without a nearby phone, something offered in the Apple Watch Series 2. This can be particarly important to runners, who may want to track a route without carrying their phone in a pocket or armband. Android owners can now also use Android Pay from an NFC-equipped watch, which operates much like Apple Pay. Notably, Apple Pay has been present in watchOS since the Apple Watch's 2015 debut. Another catch-up is in support for having different apps on a watch versus a phone. In the past, Android would automatically install any Wear versions of an app without a way of disabling them. 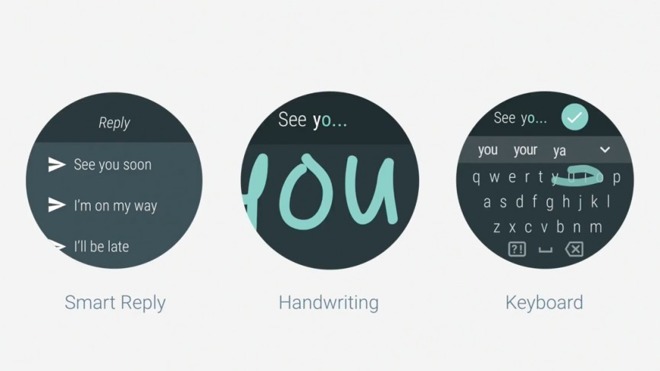 Lastly, Wear 2.0 offers both a tracing keyboard and handwriting recognition. While the former is unique to Android, Apple has the latter in watchOS 3. Wear 2.0 includes a new overall interface design, integrated with Google Assistant, which is often considered more advanced than Apple's Siri. It can for instance recognize context, which enables follow-up questions without repeating all the details of initial ones. Critically, Android watches can make use of LTE, allowing them to operate fully independently of a phone for tasks like messaging, navigation, or streaming music. Apple is thought to be working on cellular support for a future Watch, but that may only arrive in late 2017 at the earliest. Along those lines, Wear 2.0 even includes its own version of the Google Play Store, which lets people browse, buy, and download apps and watchfaces without a phone. This may finally make it a realistic option to use Android watch alongside an iPhone, since in that scenario it was previously impossible to install third-party apps. Apple Watches can't access the App Store on their own. Fitness enthusiasts may appreciate automatic workout detection for Google Fit and other health apps, which can even include guidance on technique. While there is some workout detection on the Apple Watch —that's how Activity rings are filled —watchOS won't, for example, open the native Workout app. When messaging Wear 2.0 offers Smart Replies similar to the canned responses in watchOS, but with contextual awareness, for instance showing different options for a reply in Slack versus SMS. These can also adapt based on the time of day. Apple is likely to close some gaps with Wear 2.0 later this year via a new Apple Watch and/or a "watchOS 4" release, which will likely be previewed at June's Worldwide Developers Conference ahead of a fall release. In the interim Apple is adding features like a Theater Mode and SiriKit in watchOS 3.2.